The command section of any Ætherfleet capital ship would invariably consist of the Captain, the Executive Officer or "First Mate", the Chief Engineer, and the Chief Medical Officer or "Ship's Surgeon". Most Ships would also include a Chief Science Officer, and the Commanding Officer of the Æther Marine contingent if any. Other command grade officers such as Ukp ambassadors, liaisons, diplomatic agents, scientists, etc. may also be included within the Command Section of any particular vessel dependant on it's specific mission. Command grade officers include the ranks of Lieutenant Commander, Commander, Captain and Fleet Captain although the later would also be considered a Flag Rank. 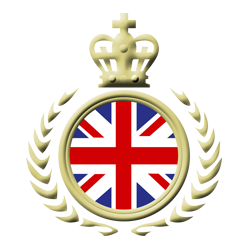 Nearly all officers of these ranks would number among the British aristocracy although there are exceptions. Most officers in the technical fields such as engineering, science or medicine are experts in their chosen vocations and will have ascended to their present ranks within their chosen field. Captains and Executive Officers on the other hand rise to their positions through an almost indefinable process of excellence, recognition, leadership and force of personality. An Æthership Captain on the Bridge of his ship is the last bastion of absolute dictatorial power known to human kind. With the awesome power and resources of an æthership the men that command them must be paragons of leadership and confidence. On their ships their words are law. In many instances they are saddled with the charge of investigator, judge and executioner without any contact with Ætherfleet command. About half of the command grade officers are graduates of Ætherfleet Academy. The academy is located in Maidenstone, Kent just outside of London and only minutes away from Ætherfleet Command Headquarters in Greenwich on the Thames. This institute of learning was founded in 1900 and has served as the preeminent seat of learning for military and extraterrestrial studies in the solar system. An Ætherfleet Academy graduate will command high respect both on Earth and throughout the system. Students graduating with honors or first in their class are destine to become history makers and characters of popular mythology. Onboard ship the command grade officers appreciate a standard of living befitting their rank and station. They are in charge of their respective sections and are only answerable to their Captain. All command grade officers onboard a ship must form a personal and tight knit group that the rest of the crew can respect and follow blindly. Any infighting within the command section of a ship can prove to be devastating to the moral of the crew. The Æther Marine commander onboard and Ætherfleet vessel is an exception to most of the naval tradition inherent in the Ætherfleet. Marine commanders are given honorary rank of Lieutenant Commanders although in Army rank they may be any rank from Lieutenant to Marine Captain.Command grade officers wear similar uniforms with color schemes matching their specialties. The standard uniform consists of a double-breasted coat with command epaulettes and insignia over a white turtleneck pullover. Wide belt with UKP belt buckle cinch the outer coat. The trousers include side stripes and are bloused into high black boots. Captains and First Mates retain the blue and white of the regular ships crew albeit with lots of trim and ornamentation. 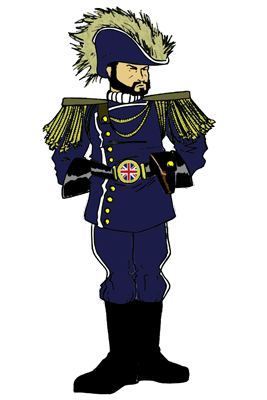 Section chiefs wear similar uniforms in blue and their section colors; black for engineering, yellow for science and green for Gunnery. The medical officer wears predominantly white with blue trim, which is the reverse of the Captain and XO. Command officers wear distinctive naval hats with crests and plumage in accordance with a variety of enigmatic conventions. The only exception to the Command grade officer uniform is the æthermarine officer who wears the familiar red army dress uniform. Command grade officers wear similar uniforms with color schemes matching their specialties. The standard uniform consists of a double-breasted coat with command epaulettes and insignia over a white turtleneck pullover. Wide belt with UKP belt buckle cinch the outer coat. The trousers include side stripes and are bloused into high black boots. Captains and First Mates retain the blue and white of the regular ships crew albeit with lots of trim and ornamentation. 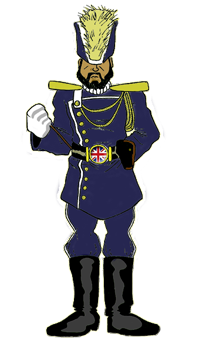 Section chiefs wear similar uniforms in blue and their section colors; black for engineering, yellow for science and green for gunnery. The medical officer wears predominantly white with blue trim, which is the reverse of the Captain and XO. Command officers wear distinctive naval hats with crests and plumage in accordance with a variety of enigmatic conventions. The only exception to the Command grade officer uniform is the æthermarine officer who wears the familiar red army dress uniform.